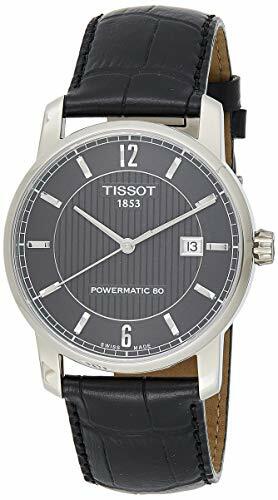 Tissot Men's Carson Titanium case, Leather strap, Black dial, Automatic movement, Scratch resistant sapphire, Water resistant up to 5 ATM - 50 meters - 165 feet Titanium case with a black leather strap. Fixed titanium bezel. Black dial with silver-tone hands and index hour markers. Arabic numerals mark the 6 and 12 o'clock positions. Minute markers around the outer rim.